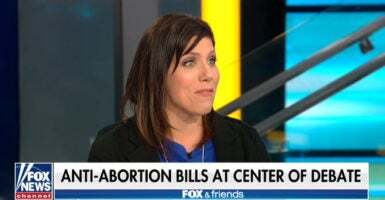 Three abortion survivors told their stories on “Fox & Friends” Monday morning, and reacted to comments from Virginia’s governor supporting late-term abortion as well as pushes in a number of states to legalize abortion until birth. “When I was 13, my adoptive parents, they sat me down and told me about how my birth mother had actually had a curettage abortion when she was two months pregnant with me,” Presley said. “And a curettage abortion is a type of abortion where the doctor goes into the mother’s womb and basically rips the baby apart and brings it out in pieces,” Presley continued. Culwell’s mother was 13 years old and five months pregnant when she attempted to abort Culwell in a dilation and evacuation abortion. After complications, Culwell’s mother went back to the abortion clinic who told her that the abortion was successful but that she was pregnant with twins and that the second child, Claire Culwell, was still alive. “So she actually sought out a second late-term abortion in Kansas, but they, because of a risk of infection, they weren’t able to do that so I was born six weeks later,” Culwell said. A number of states—including Rhode Island, Vermont, Virginia, Maine, New Mexico, and Maryland—are considering proposals to expand abortion access.